Winner: So what elasmobranch would beat Usain Bolt in the 100m sprint? Well, probably the fastest shark in the world: the shortfin mako (Isurus oxyrinchus). These amazing sharks can swim up to 144 km/h (Motta et al., 2012)! How do they do it? Mako sharks have several adaptations that enable them to swim fast. Firstly, their bodies are streamline, powerful, and have scales that reduce drag over the skin (Motta et al., 2012). Secondly, the shortfin mako is an endothermic shark, meaning it can retains metabolic heat for increased muscle power (Carey and Teal, 1969; Sepulveda et al., 2004). Lastly, a shark’s tail is adapted for efficient swimming; it swings from side to side, creating twice as many jets of water as other fishes’ tails, smoothing out the thrust. Above: Shortfin Mako (Isurus oxyrinchus). IUCN: vulnerable. Winner: Great white sharks (Carcharodon carcharias) would probably win the high jump; they have been known to accelerate at 35-43 km/h, jumping an amazing 2.5 m above the waters surface (Bernvi et al., 2005; Johnston et al., 2018)! This breaching behaviour has been well-documented in South Africa when sharks target their prey, Cape fur seals (Martin & Hammerschlag 2012; Martin et al., 2005). Less well-documented is breaching by mako sharks, although they have been filmed jumping to a height of nearly 4 m! Check out this cool video here. How do they do it? Great whites’ ability to jump so high is related to their streamline but powerful bodies and their large amount of white muscle. Actually, sharks have two types of muscle: white and red. But it’s this white muscle that is responsible for bursts of energy, and a sharks body is made up of up to 80% of the stuff! Their red muscle does play an important role though, with a rich oxygen and blood supply it enables sharks to swim for very long periods of time. Above: (Johnston et al., 2018); Basking shark breaching (left); Great White shark breaching (right). Winner: A Great White might also win this one… the longest migration of any elasmobranch was completed by a female names Nicole, who travelled from Africa to Australia and back- totalling 12,400 miles! But, for the sake of diversity lets not forget Anne, a whale-shark (Rhincodon typus) observed to migrate a whopping 12,000 miles- the longest ever recorded trans-Pacific migration! How do they do it? Migration has evolved in many animals, but long-distance has been shown to favour swimmers. For example, by comparing the cost of transport among animals that run, swim or fly, Schmidt‐Nielsen (1972) found that swimmers move with the lowest energy cost. Furthermore, marine animals have been known to exploit sea currents for migration, enabling them to travel long distances (Alerstam et al., 2003). Above: Whale shark (Rhincodon typus) and her pup. IUCN red list: vulnerable. Winner: synchronised swimming takes teamwork. And Cownose rays have some of the best. Every year thousands migrate from the Chesapeake Bay to their wintering grounds in Florida and back again, producing a stunning spectacle (Schwartz, 1990). How do they do it? Unlike most sharks, Cownose rays are able to orient in the same direction, just like synchronised swimmers (Smith & Merriner 1987)! 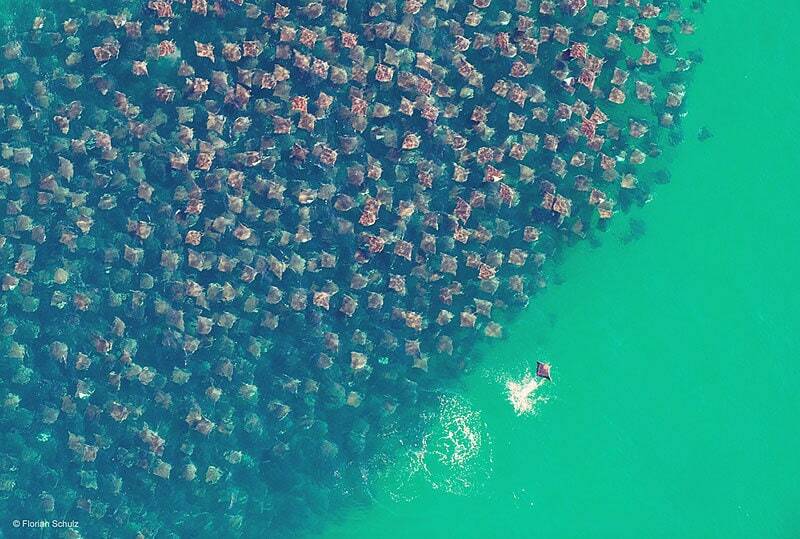 They also tend to swim in triangular diamond shape formations, presumably to increase swimming efficiency. Alerstam et al. (2003). Long-distance migration: Evolution and determinants. Oikos. 103. 247 – 260. 10.1034/j.1600-0706.2003.12559.x. Carey & Teal. (1969). Mako and porbeagle: warm bodied sharks. Comp Biochem Physiol28: 199–204. Johnston et al. (2018). Latent power of basking sharks revealed by exceptional breaching events. Biol. Lett. 14 0180537; DOI: 10.1098/rsbl.2018.0537. Martin RA, & Hammerschlag N. (2012). Marine predator-prey contests: Ambush and speed versus vigilancea nd agility. Marine Biology Research; 8: Pp. 90-94. Motta et al. (2012). Scale morphology and flexibility in the shortfin mako Isurus oxyrinchus and the blacktip shark Carcharhinus limbatus. Journal of Morpohlogy. 273(10). Schmidt‐Nielsen, K.. (1972). Locomotion: energetic cost of swiming, flying and running. Science177: 222–228. Sepulveda et al. (2004). Movement patterns, depth preferences, and stomach temperatures of free‐swimming juvenile mako sharks, Isurus oxyrinchus, in the Southern California Bight. Mar Biol 145: 191–199. Previous Post Can sharks learn?